Once you enter into the fenced yard, you have arrived in paradise!! Welcome to this private oceanfront estate. Upstairs, there are 2 bedrooms and 2 bathrooms and downstairs is 1 large bedroom and 1 bathroom. Relax by the pool, which is heated in the winter, while the kids play in the sand. Or take a walk on the 350' pier. Feel free to fish off the pier or just jump into the Atlantic ocean to cool off. There are 2 kayaks that you can use if you feel adventurous. Also, there is a ping-pong table. We really enjoyed our week!! The house was perfect for our family. The new dock is awesome, our kids were able to catch fish( red snapper and something else). Our week was very windy and water visibility was only ok so the heated pool was a favorite. Shanie and Kevin were very helpful. Beautiful property on ocean side! We had a great time. Just a couple things about this beautiful establishment.....1) the main bathroom needs some serious work in the shower. The shower head leaks water and sprays every where. I am afraid that the moisture on the ceiling will eventually start to mold. The same shower has a bamboo rail that falls out constantly. 2) we purchased wash cloths as we couldn’t find any. 3). The smell from our beach didn’t bother us as we are aware that it is seasonal and we have stayed on the ocean side before and enjoy watching the sun come up. 4). The dock is fabulous!!!! We enjoyed kayaking, fishing and sunning on the pier! Great place just needs a little TLC. I'm so glad you and your family had a great vacation at the house and we appreciate you staying. I wish you would have let me know during your trip about the shower head leaking. Unfortunately, you told me right after you checked out of the house so I couldn't have it fixed for your stay. I did have my maintenance man replace the shower head right after your departure so it works for the next renters. And I'm sorry about the wash cloths. The cleaning ladies put them in the linen closet. For the future, I will have them leave them in the bathrooms. As for the TLC you mentioned, I know that no house or hotel is perfect which includes this one, but we do strive to continually make improvements as we can to make the house as perfect as possible. I've been to countless hotels and vacation homes and trust me when I say I can pick apart just about every nook and cranny- haha. I'm sure we all can. We do try out best to make sure you have a fabulous vacation and we're so glad you enjoyed yourselves. We're thrilled that you enjoyed the dock/pier and the other activities at the house. Hope you come and stay with us again. Definitely Not worth the price!! This was our first time to the keys. We pulled up to the house and was hit with a stench that was overwhelming. This nauseating smell may be a normal thing but first time visitors need to know. It was the rotting seaweed that was pushed to the shore. This rotting debris lined the entire property's shoreline at least 15 feet deep along with all kinds of trash, buoys, bottles, cans, plastic containers, etc. Standing on the sand area you saw massive litter and rotting debris. The lots are empty on both sides. No one is cleaning that either. Other lots looked good. This was not an overnight culmination because we saw what the tide brought in daily. The smell wasn't as bad some days but always present. The pool had a multitude of dead worms and tree foliage. Floating and sunk to the bottom. Super disappointing. We saw a pole and net and decided we would clean the pool ourselves. Little later after we arrived, the maintenance man shows up. He is there to take the trash cans. He does nothing with the pool. He said that he turned the heater on earlier. We talked about the terrible smell. He stated that it was normal. He left. Very surprised he left with the pool looking bad. We scooped it for 4 days and wore water shoes because no way you could get everything out of it. I emailed Shanie that there was an issue with the filtration. On Wed. the maint. guy comes back and cleans the pool. I beg him to leave skimmer on. I know that there is no way you can keep a pool clean of floating debris unless the water is going thru there. He tells me that they don't like to leave the skimmer running because they are afraid the pool water would evaporate below the skimmer lever and burn up the pump motor. I promise that I will fill the pool with water if it starts looking low. He leaves it on. For the rest of our visit, the pool stays clean. Shocking what a skimmer will do... Upon entering the house, I was a little surprised that it wasn't cleaner. Like the front door was filthy where people open and grab the door. The lamps and blinds were super dusty. Some closet doors needed fixed and cleaned. Expected it to be a little better kept. The ad is incorrect. No kayak or canoe. (Maint. guy said not for a long time) There is no gas grill. The hammock was present but unusable. Texted Shanie. The oven didn't work. I called Shanie. (replaced day we left). We were not in a financial position to change places so we were forced to make the best of it. I will address the inaccurate information from the renter at the house. First of all, the smell which is there from time to time (not often at all) is that of seagrass that washes up near the seawall. This happens throughout the Florida Keys and it is very important to the marine food web and the dune ecosystem. There is nothing anyone can do about that, but it is taken out with the tide. You will most likely smell the ocean salt-water air if you are anywhere in the Keys by the water. Sometimes there is some trash that is washed up due to people littering in the ocean. My landscaping crew does clean that out every week (if there is any). It is extremely inaccurate that it is 15 feet deep since at any given time, there is at most 2 feet of water at the shoreline. Even if you go to the end of the pier which is 350' away from the shoreline, it is only 4 feet deep in low tide and maybe 7 feet in high tide. My husband an I along with his siblings and spouses went on our first all together vacation and stayed in this wonderful home. We had a great time and had plenty of space for all of us. We had so much privacy and the view was beautiful. The downstairs bedroom just to let others know has. The access to the upstairs unless you go outside, which worked fine for us but just I case you have little ones. We will definitely be revisiting in the future. Our Annual Summer Vacation ALWAYS Happens Here! 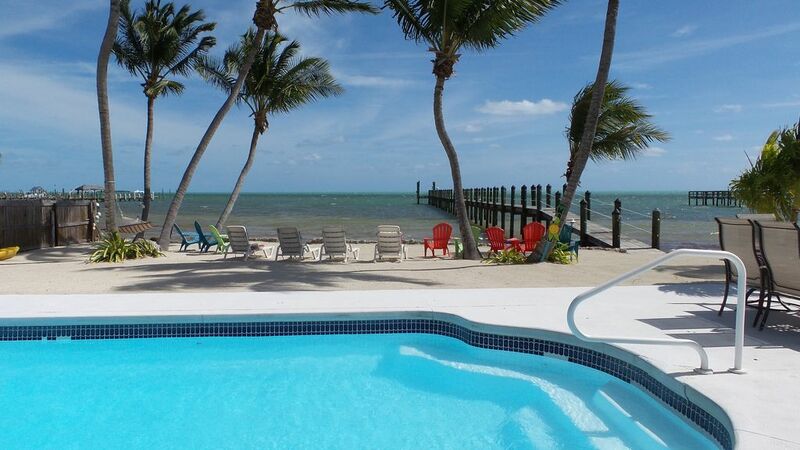 We have stayed at other places in the Keys before we discovered this gem, and I'm not willing to risk arriving at a dirty, dingy, worn-out place that looked good in pictures, when I know we can come here and always find it even better than the time before. Shanie is constantly adding new things, upgrading furniture, heck, even the KITCHEN has been updated in the last year....she loves this house THAT much, and wants it to be a comfortable, happy place for her guests, and it hasn't disappointed us in ANY way in yet. The only disappointment is the leaving part! Counting the days until we return to that beautiful dock, gorgeous view and our favorite home-away-from-home!